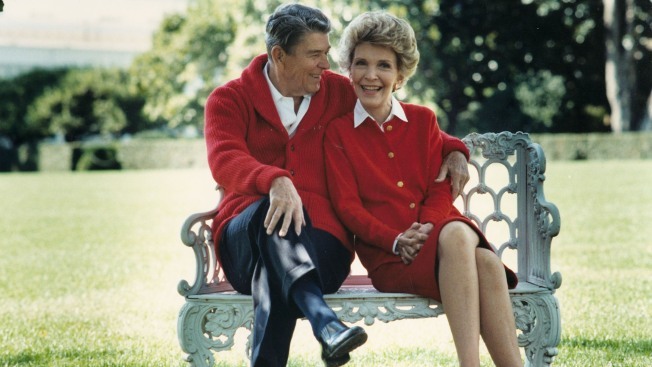 In one of Virginia's most liberal jurisdictions, political leaders are just saying "no" to a proposal in Congress to name a popular park for former first lady Nancy Reagan. Legislation passed a House committee last month to rename Gravelly Point Park, which sits on federal land adjacent to Ronald Reagan National Airport. The bill's sponsor, Georgia Republican Jody Hice, said renaming the park for the former first lady - who is commonly associated with the "Just Say No" drugs campaign - "would be a fitting tribute" given its proximity to the airport that bears her husband's name. The proposal, though, is not supported by political leaders in Arlington County, a suburb of the nation's capital, where the park is located. "It's not an absolute blanket opposition to Nancy Reagan,"said Rep. Don Beyer, D-Va., who represents Arlington in Congress. "I object to a member of Congress from Georgia trying to name a park in somebody else's district." The park, which sits on the Potomac River next to the George Washington Memorial Parkway, is best known for the impressive views it affords of the airport's landings and takeoffs. Jets roar overhead to the delight of families, and photographers are invariably drawn to the park. "We would never act as a local legislative body without a whole lot of public input,'' she said. "Gravelly Point already has a name. It's featured in the commonwealth's tourism promotions,'' she said. "It's really a gem for our community. Kids become totally entranced'' when they see the planes come in. Grover Norquist, a conservative activist who also heads up the Ronald Reagan Legacy Project that encourages opportunities to name parks, bridges and mountains for the Reagans, said he supports the plan. Norquist said that in addition to the proximity to Ronald Reagan airport, the idea makes sense because another park along the George Washington Parkway is named for another first lady - Lady Bird Johnson. "What contribution did she really make?" asked Akosua Kyeremateng, a resident of a nearby community. But Carter Bowns, a resident of Purcellville, liked the idea. "All the political correctness drives me crazy,'' he said. The debate over naming the park has not been nearly as high-profile as the 1998 decision to rename the airport for Ronald Reagan in some people found it to be a particular slap in the face given Reagan's decision to fire air-traffic controllers when they went on strike, and many in the D.C. area for years refused to call it Reagan Airport, opting for old National Airport name.